Operating a business in today’s modern world almost always includes technology in some way or capacity. Whether it is all-inclusive, such as a business operated entirely in the virtual arena, or something simple, like basic bookkeeping or inventory management software, most businesses in operation will have some tech listed in their company’s assets. Supporting tech is, many times, a job that falls well outside the skill set of the average employee. While most people have at least a modicum of tech understanding these days, the in-depth servicing that keeps a company network running smoothly must be handled by a professional. A failure to do so can result in innumerable problems, many times even situations of such severity that the business has to close its doors. Following is a list of some of the most popular IT support services that you may want to include as part of your overall operational strategy. As many in the IT support field can attest to, many problems that reach their level can be avoided by making sure end users have at least a working knowledge of basic areas of technology. Catching a mistake in mid stride, or avoiding it altogether, can save a business the valuable time and resources that are gobbled up with each service request. While most people these days do have a working knowledge of personal computing operation and issues, business-related ones may fall outside their scope of knowledge. As a result, one of the most helpful, and overall preventative services that some IT support companies offer is basic instruction to the average employee. These can take the shape of anything from interactive instructional software or videos, on up to informative classes headed up by a real professional. One of the most difficult parts of using technology in a business capacity is the actual setting up of the hardware and software in the first place. Contrary to how relatively easy it is for most people to set up a network in their home, a business network contains many more parameters and settings that must be precisely right in order for everything to operate properly. Unless your business has a dedicated IT support staff, this is most effectively handled by a professional. The challenges don’t stop once the network has been set up. A business network needs constant monitoring and maintenance to operate at peak efficiency, which falls well outside the skills possessed by the average worker. This area of support has increasingly begun to be outsourced to companies dedicated exclusively to this type of service. One of the single most important parts of network maintenance is making sure the network is completely shielded from outside threats. So much so, that it is usually listed as a separate and dedicated service apart from all other aspects of IT maintenance. The list of ramifications that can result from a network that has insufficient security and protection is equal parts lengthy and serious. Network security is achieved through constant monitoring and evaluation of potential weak spots and areas of vulnerability. New exploits that would otherwise compromise the safety of your valuable data must be addressed, many times on a daily basis. Equally important are all the latest software patches and updates, especially when related to your firewall or virus protection suite. Outsourcing this service means that you will receive care from dedicated professionals, without the cost associated with retaining your own IT department. No matter how nice a business’ computer equipment is, employees operating the workstations that handle the lion’s share of your company’s data will usually run into hardware or software related problems at some point. These issues can range from the simple need to install a critical patch, on up to the complete failure of a vital suite of software. It is therefore, vital to have someone available that can access your employee workstations, who is fully trained on how best to fix any problem. Many times, these services can also include monitoring of the activity that takes place on each workstation, to ensure that employees are doing what they are supposed to be doing. One of the single most scary possibilities that can strike at the heart of most of today’s businesses is the loss of critical data. As most data these days is stored electronically, its protection falls firmly under the purview of the IT support specialist. Attempting to recover data that has been lost can be extremely pricey, putting it out of reach of many small businesses. It should come as no surprise that a large portion of businesses that lose their data usually close down within one year. As a result, data backup and integrated recovery services are some of the hottest services requested of IT support companies. Usually data is stored redundantly, and can be restored within minutes, keeping downtime to as little as possible. Many services even offer virtual solutions that can step in, the moment your own equipment becomes inoperable, seamlessly, and with no interruption at all. With many small businesses, email is one of, if not the most used, methods of communication. As such, making sure that email software and associated hardware are monitored and kept running flawlessly, can many times spell the difference between business success and failure. While sending or receiving an email is pretty cut and dry, maintaining the architecture that allows this ease, is not. One of the most effective ways to gain an effective presence on the internet is Search Engine Optimization, or SEO. A support service related to SEO can make sure that the wording of your website, and the different advertisements that you run, are perfect in terms of how high they are placed on the search results for different keywords. In essence, your goal is to have your business at the very top when a customer types in a specific string of text. Understanding the different rules and strictures related to effective SEO is many times difficult to grasp for the average individual, even one well versed in writing effective copy. An SEO expert can tweak things to the point where you can enjoy higher rankings than ever before. In addition to the different types of support that are offered by various IT support businesses, there are also different ways that the company can actually deliver the service itself. Some methods are strong for some situations, but not so much for others. Following are the most popular ways that IT support can be provided to your business. One of the most basic, yet most effective, means of delivering IT services is through email or a chat box. Most websites that offer a product or service of any kind include the little chat box on their website that offers connection to a live support person. Rather than have to juggle a phone while trying to perform a fix, users can type their question in with great detail, and simply follow the directions that are returned by the IT expert. When it comes to ease of use, affordability and efficiency, chat support is truly a top contender. Email support is also a prime way to gain IT support, albeit a potentially much more time consuming one. The email has the advantage of allowing you to compose your thoughts and questions completely, before the request is submitted. Unfortunately, it can sometimes take hours, or even days, to get an answer. While email may have its uses for less time critical issues, it is a poor option for things that need to be fixed ASAP. With the introduction of the fast broadband internet that is so commonplace today came the rise of remote technical support. Remote support allows a technician at one location, to virtually “dial in” to a customer’s computer to evaluate problems and provide appropriate fixes. This is accomplished through the use of remote-access software, which is installed on each client computer once service by an IT support company is begun. 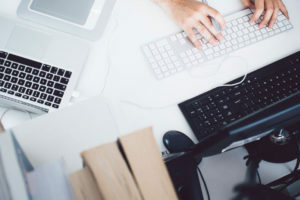 While remote support is usually best utilized by a larger business with multiple locations to service, small businesses can easily take advantage of these services too. Fixes that involve remote-access solutions are quite a bit less pricey than having a tech come out physically to your location. Not only that, you can have your problem rectified in short order, without having to wait for the tech to arrive. An oldy but goody, phone support has recently seen a decline in use when compared to other digital solutions. However, it still has its place in many IT support scenarios, and is a quick way to explain and receive answers from a knowledgeable pro with the greatest detail. While we may see an even farther movement from this method in the coming years, it still remains as one of the best ways people are most comfortable with in receiving assistance. When all digital and phone options have been exhausted, it may come time for a technician to actually come out to your place of business and handle it themselves. This is most often seen when the problem is fairly large, or the employees of a company have no clue whatsoever on how to fix even simple issues. An IT support technician can visit the place of business, identify the problem and institute a fix in short order. This bypasses the possibility of any exacerbation of the problem due to inexperienced hands. The different variations of IT support available today, as well as the methods by which it can be provided, are especially effective at handling most normal problems seen by any company on a daily basis. As software and hardware evolves even further in the coming years, expect the number of options, and their affordability to increase in an effort to match. Contact Network Depot for more information.